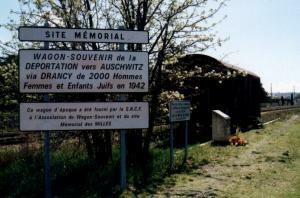 Between 1941 and 1942 Le Camp des Milles was used as a transport camp for Jews et al. More than two-thousand of those held there were eventually shipped off to the Drancy transport camp before being sent to the Auschwitz concentration camp. This was done as part of an agreement between the German government and Vichy government of France. "Memorial coach (train boxcar) of the deportation to Auschwitz, via Drancy, of two thousand Jewish men, women and children in 1942..."
"From this platform in Aug-Sep 1942, 1928 Jewish men, women and children were deported from Camp des Milles to Nazi extermination camps via Drancy. Refugees from Central Europe or French Jews, they were delivered....by the Vichy government before even the German occupation of the South Zone, among them 92 children. Keep this in your memory for the present and the future." 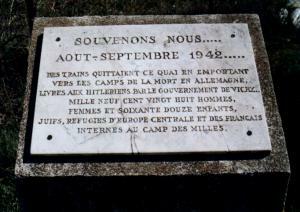 "Let us remember those who.....August-September 1942.....in the trains left this quay, carried to the death camps in Germany,(filled) by the Hitlerians, (spoken for) by the Vichy government, 1928 men, women and 72 children, Jews, refugees of Central Europe and some French interned at the Camp des Milles."